*Disclaimer: This guide does not apply to the following shops: Magic, Battle Magic, Defense Magic, Tyrannian petpets, Magical marvels, Royal Potionery, Merifoods. You’re on your own. To start, have 60k – 500k or so on hand, depending on the shop. Determine where you want the items to go after buying. Either put it in your safety deposit box or shop but don't leave it in your inventory. ABrosia will automatically stop if your inventory is full. Next step, if you want to auto price it is set what criteria you want to price. I use Lowest because I want my prices to be lowest out of multiple searches. Once in a while, when the system determines you've refreshed too much, you'll get a Restock Ban which is where all stores will tell you they've sold out when they really haven't. These last between 12-48h, find something to do during that time. By default, the AB will switch to igloo autobuying but these have a limit of 10 items per day. Iglooing isn’t bad but you will need to set your profit margin to less than 5000. You’ll get a lot of neat items to supplement your income. Settings: Your settings should reflect how much risk you want to take. Too slow will make you miss restocks, too fast will get you banned quicker. Split this more or less evenly to achieve the total. Timing: Different shops are better at different times of the day. You should find a shop you like and experiment during different times in order to maximize profit. Since I like to keep to 5 hours a day, I make sure that those 5 hours are spent buying as much as possible. If you aren’t doing well during a specific timeframe, move it to another. Not every day will follow the same pattern. For example, weekdays are better than weekends because there are less people, or rather people with less free time. Mornings and afternoons are better than evenings because you have all the leet players aka teenagers in school. Half Price day is a special day when you must AB as much as you can whenever you can. Other factors that may affect success rate: latency. ABing at night does give you the advantage of being closer to np servers, provided that you live in North America. Latency is more important than connection speed. Clearing/Shophunting: This explains half price day and why ABing is much better on that day, but you must use this strategy everyday. When a shop is full, there is not much chance for new items to appear. If you see a shop with 3-4 full rows of items, that shop will hardly stock anything good, or fewer quantities of them. Advanced RSers like to “clear” a shop to make room for more items during the next restock by buying up junk, hoping that the potential profit they make offsets the investment. What does this have to do with you? Before you decide to AB, take a look inside a shop and see how empty it is. During busy time periods, you’ll see < 1 row, meaning a big restock is coming and you should AB there. This doesn’t mean you won’t catch good items with a full shop, but you will have to compete with more people scrambling over the same item. On half price day, most people buy what they can because their profit margin has improved, so a lot of the “clearing” is done for you, unintentionally. Shops: If you are not advanced yet, you don’t have a lot of control but you do have a little. The key here is to focus on your controllables. As mentioned, there are peak times when it is better than others. Stick to mornings and afternoons. Restart the AB as necessary to start in the shop you want. If you are advanced, you may ask the following question: “But Scot! How will I know which shops to AB at?” The answer is simple, do you like getting big ticket items every now and then or do you like a small but steady stream of income. There are shops to fit all personalities! 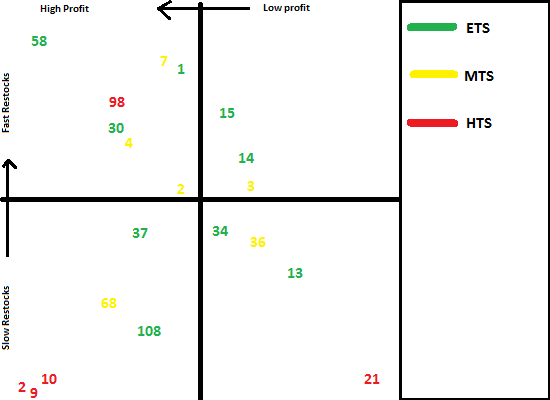 Included is a chart to represent the type of profit you can make per shop. G/Y/R shows how easy it is to sell items from that shop. Shops that restock quickly vertically converge towards the top left corner. Shops that are high profit converge towards the left corner. Ideally, you want to stay as close to the top left corner as possible, but I prefer to stay close to the middle. This is NOT an exhaustive list, just the shops I am familiar with. What I didn’t include is how dangerous each shop is to AB in, this should be obvious: Magic, Battle Magic, Defense Magic, Tyrannian petpets, Magical marvels, Royal Potionery, Merifoods are all dangerous. Approach with caution, unless your account is less than 3 months. If it is, don’t bother with those shops. Accounts < 16 days stick to the pharmacy. Strategy: I prefer to stick to things I can sell in my shop. People either want your item for that price or they don’t, easy as that. The items in the middle of the chart are medium profit items that restock quickly enough you can make np purely by quantity over quality. Low Rarity expensive items: Another strategy is to hunt for special items that are worth more than their rarity dictates: Gourmet cooking for your pet( r50), Bag of peanuts (r79), Snorkle Snout (r80), Zafara Double Agent Plushie (r90), Kacheek Pyjama Cap (r93). The reason being is they are worth as much as UBs but stock more often and in larger quantities. Unbuyables: UBs are a double-edged sword because they are more time consuming to sell but yield massive profits. In the following data portion of this report, you will see that auction/trading post profits comprise a large chunk of my profits. Your preference will dictate what shops you go to. Advanced members can go to the restock list and sort items by profit > descending to get an idea of what range the items fall into and decide whether or not you want to mess with UB heavy shops. The more time you are available to spend onsite to check neomails for offers, the more profit you can make. If you decide to go down this path, the UBs will start to pile up over time and you may find yourself liquidating them in your shop at prices that would make resellers look like non-assholes. To make cash-money, refer to the Ultimate Guide on How To Sell UBs. In all seriousness, to sell your items you need to not take the IDb too seriously, as prices can fluctuate wildly to the tune of a few hundred k up or down. Sell HTS for what you can get it for. Throw 200-250k items in your shop for 99,999 and go do something worthwhile with your time. And that’s how Scot ‘C’s it. there's two 2 in the chart. one in yellow one in red. Thank you for this guide. The refresh time are clearing up a lot about what is possible and normal. Great job on working on this guide and everything. Helps me a lot! So you still recommend ABing ~5 hours a day in ONE shop for at least two weeks? I have mine alternating between 4 shops, but if 1 is the way to go I will try it out. Also, can you offer any suggestions/explanations for the haggle algorithm? I have mine on smart as I heard it was the best, but I also have it set to 3 percent, so I would love to know a little bit more about how it works. Does smart simply make it look more like a human like 1313, and then the percent being the amount you wish to offer versus what is requested, as in 3 percent may be hurting me and I should lower it a bit? Thanks +rep! Scot, thank you for your very simple yet effective guide! Now whenever a newbie asks for AB times, I'll just point them to this guide and they'll actually understand with one read. 1 is the way to go. As for time a day, you should gauge how long it takes to get restock banned and ab 1 hour less than that. I just happened to get banned a lot after 6 hours. Smart haggle is so much better that the option should be locked by default *kicks SL64*. Percentage wise it'll deduct as close to you percentage as possible. For example 1% smart haggle on a 5k item means it will try to bid 99% of the item which is 4950 but the algorithm automatically changes it to 4949 to make it look more legit. A 3% haggle makes the base haggle 4850 and abrosia automatically changes it to 4848. In general it makes the deduction first then it formats the price to either XYXY or XYX, or XXXX. 5% is the absolute lowest you want to set it. The farther away from the asking price, the lower chance you can guy the item. It's possible to buy an item by offering as low as 80% for me personally but it took a lot of tries to make that possible. There's absolutely no purpose in being a cheapskate and trying to save 10 np here and there and risk missing the item there when your profits are in the hundreds of thousands. Edited by Scot, 01 July 2011 - 04:53 PM. So, if im not an advanced member, does abrosia choose what shop i restock at? and When is half price day? "If you are not advanced yet, you don’t have a lot of control but you do have a little. The key here is to focus on your controllables. As mentioned, there are peak times when it is better than others. Stick to mornings and afternoons. Restart the AB as necessary to start in the shop you want." So it does choose but you can restart it to get a decent shop. You could always choose which shop you want to RS at yourself, you need to create your own list though. 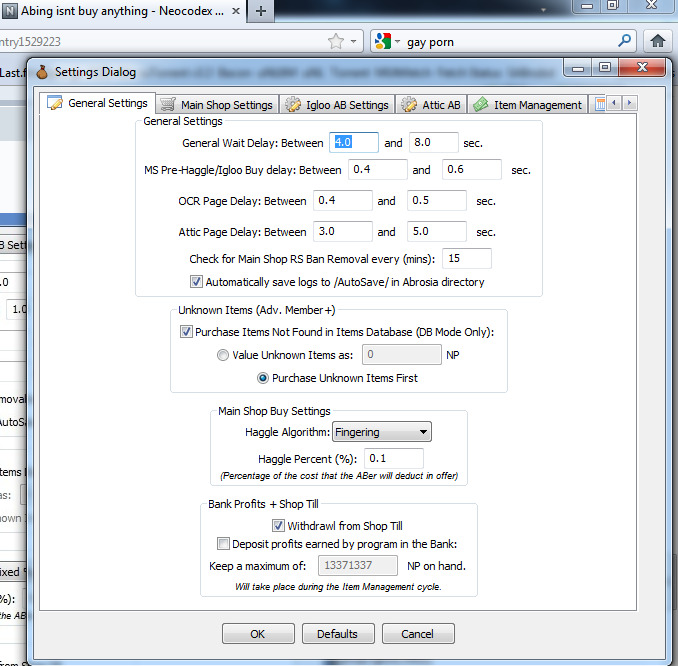 Go settings->main shop settings then select the "Load from a manual shop list" option. Edited by koobe, 01 July 2011 - 07:02 PM. but i always entered the "normal shops"
Did you make sure to enter the correct shop id and that that shop actually stocks the items in your list? It could just be your a normal member / internet speed that makes you miss out. I just use the random shop function atm and only get a couple of items overnight with a profit of 5000np. so have you ever gotten good things with lists? wow~~~That surprises me!!! may i ask you more question? i want to know how long do u AB every day??? when it's midnight in Neopet, does it often restock in shops?? ?